Recording Skype video calls is now very easy, and Skype has built-in video recording capabilities. But it’s still a bit difficult to record high-definition Skype video calls. Below I will introduce 5 tips to improve the quality of your video recording. Tip one: has a computer with large memory and faster CPU speed. HD video requires more memory and CPU processing resources. If your computer is slow, you may drop frames while recording video, and the video will not be smooth. Has a network connection speed of 2MB or more. The transmission of HD video requires more bandwidth. Tip two: you need to make sure that the light around you is bright, the gray light will eclipse the camera with HD function. You can choose to sit in front of a bright window or have plenty of light. Tip three: you also need to install a software that supports Skype video HD recording, only software that supports 1080p video recording can record HD video. Tip four: Exit the software that takes up more resources before you start recording. Because more CPU and memory resources may be needed during video recording. 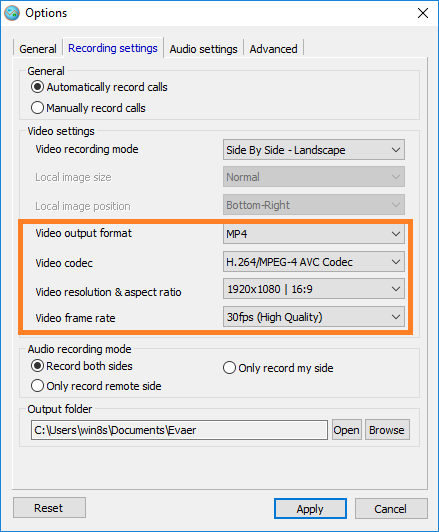 Tip five: the correct settings are also an important factor in the success of your HD video recording, you can refer to the parameters below to set. Now, you can then record your video call with the best video quality. This entry was posted in Uncategorized and tagged Best Skype video recorder, Free HD Skype recorder, free Skype recorder on January 3, 2019 by admin. We have released a new version of Free AnyCap screen recorder, that has added the new feature for supporting multiple channel audio recording. Now you can use it to capture any sound on PC. Free AnyCap Screen recorder allows you to capture audio and video streams through live discussions on Facebook, Skype, Google Hangouts, so as to view them at a subsequent moment. The program requires minimal user interaction, as it largely runs in the background. If it finds a recently initiated video phone on Facebook, it automatically begins recording information from remote, local or equally webcams, keeping the output (from MP4 or AVI format) at a user-defined site. Another possibility would be to trigger the sound extraction mode, meaning that just the audio dialog is recorded and stored in MP3 format, together with the chance to pick the video source flow. In fact, there are a number of recording settings which may be configured. It is possible to set the resolution (it affirms worth up to 1080p) and the aspect ratio, adjust the video frame rate and pick the video codec or teach the program to automatically adjust upside down movie pictures. 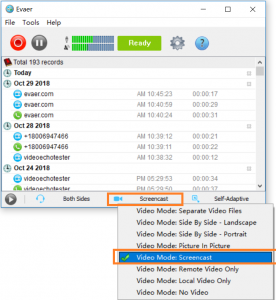 Free AnyCap Screen recorder is effective at shooting video streams and exhibit them create a new video file for every webcam flow. With simplicity of use as one of its most important attributes and focusing on output , Free AnyCap Screen recorder is the perfect instrument for shooting worth-remembering conversations. It can help you participate in important occasions and generate an entire movie record, even when you’re miles apart from the friends or loved ones. This entry was posted in Uncategorized and tagged free audio recorder, free game recorder, Free screen recorder on December 26, 2018 by admin. 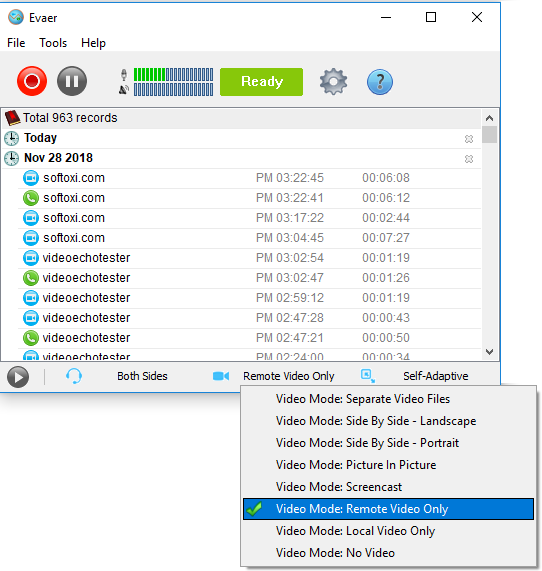 How to record remote side Skype video only? Sometimes, we only need to record the remote side Skype video only, but only Ecamm and Evaer Skype recorder support recording remote Skype video only feature. I will show you how to do that using Evaer for Skype. Step 2, Install Evaer and run it. Then change the video recording mode to “Remote video only” option as below image shown. 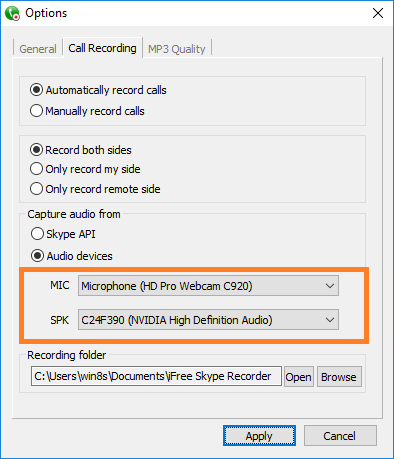 Step 3, Start a Skype call to record it using Evaer call recorder. It will record the remote side Skype video only as you set. This entry was posted in Skype Video Recorder and tagged record remote Skype video, Skype Recorder on December 2, 2018 by admin.